Unfortunately it seems that such elite hostility to Israel will be showcased at a conference scheduled for April at the University of Southampton. The official announcement describes the conference as “a ground-breaking historical event on the road towards justice and enduring peace in historic Palestine.” The conference is supposedly “unique because it concerns the legitimacy in International Law of the Jewish state of Israel;” however, as students of antisemitism will know, there is nothing “unique” about singling out the world’s only Jewish state for delegitimization. 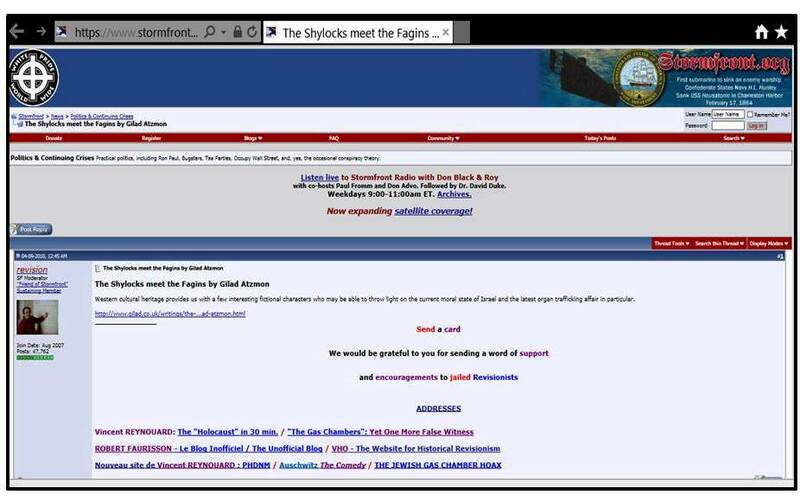 In case you haven’t heard of Gilad Atzmon, you could find out more about him on the neo-Nazi Internet forum Stormfront, where members broadly agree with Ben Dor’s view that his “voice is supremely important” – indeed, Atzmon’s writings are regarded as so important there that they are often shared and posted on the site. One could fill pages upon pages to document Atzmon’s well-deserved popularity among Jew-haters, white supremacists and neo-Nazis. So Ben Dor was wrong to complain that Atzmon is being silenced: he gets plenty of publicity at all the sites frequented by bigots looking for their daily dose of stories about Jewish cunning and evil. 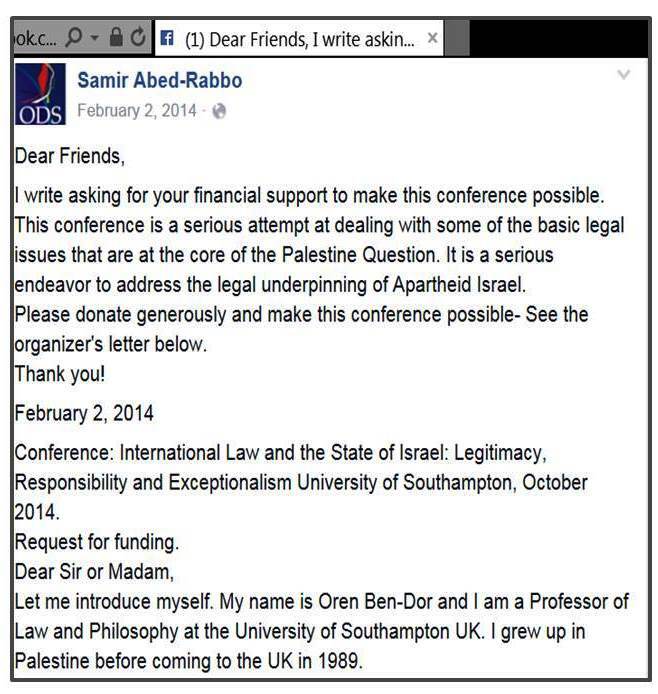 And Ben Dor himself has repeatedly done his part to promote Atzmon and his odious views, including even hosting him at Southampton University. 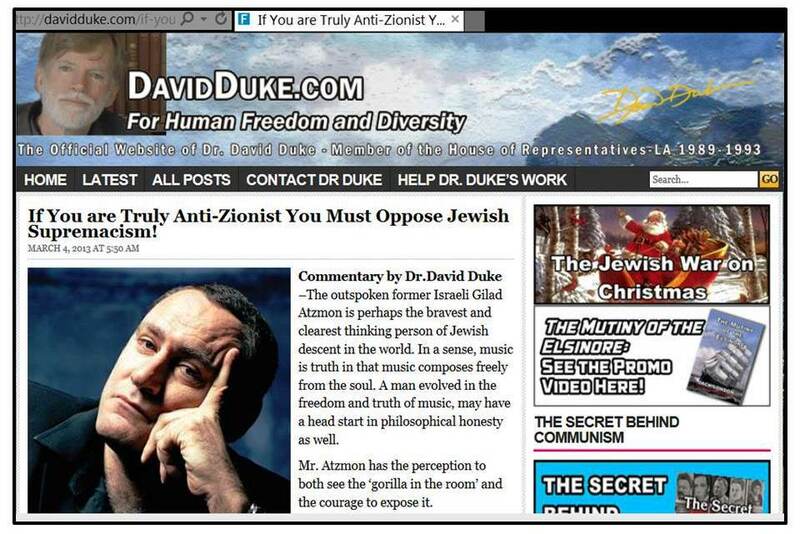 Why not also invite Duke if the “supremely important” Atzmon recommends him so enthusiastically as an expert on “Jewish identity”? To what extent Ben Dor actually agrees with Atzmon’s “gutter anti-Semitism” is hard to ascertain given that he likes to write in a style that reflects his fascination with the now utterly disgraced German philosopher Martin Heidegger; but there can be little doubt that Ben Dor shares Atzmon’s conviction that Israel is an absolute evil that cannot be allowed to exist. While Atzmon has expressed the view that even Nazi Germany was less evil than Israel, Ben Dor has repeatedly described Israel as utterly immoral and has denounced the Jewish state as “a terrorist state like no other” and demanded that “the herrenvolk (master race) nature of its democracy” must be openly debated. Ben Dor certainly knows that it is generally regarded as antisemitic to equate Israel with Nazi Germany and to argue that the world’s only Jewish state is too evil to exist. Yet, it seems that this is what Ben Dor is arguing in his political writings, and given his own emphasis on the connection between his academic work and his “political activity regarding Palestine,” the planned publication of the proceedings of his conference at the University of Southampton may turn out to be of interest not only for anti-Israel activists in and out of the Ivory Tower, but also for researchers studying 21st-century antisemitism and the ‘elite hostility to Israel’ that provides ostensibly new justifications for the oldest hatred. What’s really needed in Academia is an in-depth study of the remarkable and age-old phenomenum of Jewish antisemitism. No matter how rabid non-Jewish antisemites are (and there’s a lot of competition) it appears that renegade Jews can always do it better. We need to discover why. Perhaps Southampton University could delve into it? One comfort in all this antisemitism is that new student fees in the UK keep some people out of universities. At least the tax payer is not financing this hate for even more people. In the long term I think these antisemites are digging their own graves. Hate is unsustainable. You can only hate so much until people get tired of it. Jon Snow calls it media fatigue. This reminds me of the term: “Self Hating Jews” which tries to explain the prevalence of Jewish intellectuals inciting anti-Semitism with their extremely hateful view toward Judaism. Jewish self-hate has been described as a neurotic reaction to the impact of anti-Semitism by Jews accepting, expressing, and even exaggerating the basic assumptions of the anti-Semite. Jacobson when referring to the term “self-hating Jews”, describes them as Jews who demonize and delegitimize Israel. Jewish Anti-Semites choose to make a great deal of their Jewish origins, the better to collaborate in enterprises hostile to Jews. These renegade Jews or former Jews, give false testimony about Jews or Judaism to the enemies of the Jews. A renegade Jew thus remains engaged with Jewry or Judaism but in hatred. “I’m a Jew who has been brought to the point where he so loaths his people that he thinks in term of their destruction,” wrote Samuel Roth. This kind of Jewish Anti-Semite trades on his Jewish affiliation to give an air of authority and impartiality to his slanders. Marranos were originally Jews living in the Iberian Peninsula who more than 500 years ago converted or were forced to convert to Christianity, some of whom may have continued to observe rabbinic Judaism in secret. The term came into later use in 1492 with the Castilian Alhambra Decree, reversing protections originally in the Treaty of Granada (1491). Till today they are still considered Jews by their neighbors. Bryan Mark Rigg wrote about Hitler’s Jewish Soldiers – The Untold Story of Nazi Racial Laws and Men of Jewish Descent in the German Military. Over 150,000 Jews, half Jews and quarter Jews joined the Wehrmacht together with their Nazi counterparts to protect the “Fatherland”. Almost all of them were later sent by Hitler to the death camps only because their blood was contaminated by Jewish blood. Don’t think that by joining the pack of global Jew haters, you can cleanse yourself from your origins. Ignoring the genocidal invective is tantamount to abetting the bigotry. I approve of this conference . Let the evil and the banal gather together in one building . Let their racist comments be disseminated and their identities revealed . Please provide videos of the event. Just fed up of the KKK wearing pillow cases and hiding their identities or anti Semites using false identities . retour to the West, when the EU is faltering by the fallout of the world economic crisis, the debt crisis, the weak Euro, the social consequences of these crisis and the reawakening of the far left and far right as anti-Eu movements, supported by Russia, f.e. far-left Syriza or far right, Front National, and under pressure by the Putin gamble of the archipelago strategy, from Georgia /Abkhazia) to Poland (Danzig) and Transnistria, now Crimea and Eastern Ukrain, accompanied by RT for the useful idiots and antisemities in the west. The former East has de facto never abrogated Antisemitism, just renamed it to Antizionism, now it`s open Antsemitism again. £1.5 million (2012/13 deficit of £1 million). charities listed in Schedule 3 to the Charities Act 2011. The Parkes Institute for the Study of Jewish/non-Jewish Relations is a unique centre of study across the ages. Born in Manchester in 1960, I studied economic and social history at the University of Sheffield, focusing on minority history and urban history. My interest in ethnicity, racism and migration was further strengthened by undertaking an MA at the University of Connecticut and from there I completed a doctorate at Sheffield, researching British antisemitism. From 1985 to 1986 I was a historian and educator at the Manchester Jewish Museum before being appointed the Parkes Research Fellow at the University of Southampton. For most of the past quarter century I have been director of the Parkes Institute for the Study of Jewish/non-Jewish relations at Southampton. My teaching, research and publishing interests are in the fields of modern Jewish history, migration history, the history of racism and antisemitism, and issues of history, heritage and memory. Dr Spurling’s research focuses on the interpretation of Midrashic literature, with particular reference to Jewish-Christian relations, Jewish history from Biblical times to late antiquity, and eschatology and Messianism. Dr Spurling is responsible for developing the outreach work of the Parkes Institute. The programme of events and activities centres on developing adult education initiatives in conjunction with members of the Parkes Institute, and working with schools and colleges to develop aspiration raising activities and curriculum initiatives. The aims of the programme are to raise awareness of issues in Jewish/non-Jewish relations to the public regardless of background, to encourage progression to higher education in general, and the University of Southampton and the Parkes Institute in particular, and finally to raise awareness of the work of the Parkes Institute and Jewish studies as a subject in itself. The seventh century CE is a crucial period of both religious and world history due to the rise of Islam. This century saw the leadership of Muhammad, the writing of the Qur’an, and the beginning of the Arab conquests of the Near East. By looking at a variety of primary sources, this session will examine the events surrounding the rise of Islam and the relationships between Jews, Christians and Muslims at this time. Nothing peculiar suspicious, but a tendency towards postism. Six in Malysia,, five in Indonesia, five in Pakistan, two in Saudi-Arabia, two in Jordan, one in egypt, two in Libya, two in Iraq, twelve in Turkey. Fritz , am confused here . Are you saying that the Parkes Institute of Jewish studies at Southampton University gets funding from Egypt, Jordan, KSA, Pakistan , Libya , Iraq, turkey .Indonesia, Malaysia …. Bugger it , you would be hard pressed to find some Jews to study in most of the countries above. hey ho academics gotta make money like rest of the world . Its pretty clear where they lean to for their funding . I betcha it doesn’t influence the politics there ! These are cooperations with universities, or direct partnerships in form of institutions. And these are partnerships of the University of Southampton, not of the Parkes Institute, as I have written above.